In accordance with the guidelines established by the Virginia Department of Education, exemplary program standards for gifted learners will be achieved through the collaborative efforts of the school division, students, parents, and community. Gifted learners are those students in public elementary and secondary schools who demonstrate or who show potential for advanced thinking and reasoning, creativity, and high achievement when compared to others of the same age, of similar prior learning experiences, and of comparable home environments and culture. Their aptitudes and potentials are so outstanding that they require programs and services designed to meet their unique cognitive strengths and socio-emotional needs. In order for a student to be evaluated for gifted services eligibility, a Gifted Program Services Referral and Review Form must be submitted to start the process. Verbal or email communications do not serve as a substitute for this form. These forms are available throughout the year during normal operating hours from counseling or main office staff at county schools. There are referral windows during which students are screened and referrals are solicited. These windows are the recommended times to refer, as they occur prior to the division’s established gifted assessment dates and CBG Academy selections for particular grade levels. Signed and dated referral forms must be submitted to the student’s school by the end of the school day on the published referral deadline date to be considered for assessment during the testing window for that grade level. Referral deadlines appear on the referral form and are also communicated through gifted education publications and the school division website. If any of these dates falls on a weekend, school holiday/break, or snow day, the deadline is the end of the next school day in which school is in session. Any student identified as eligible for gifted education program services in another public school division shall be referred for assessment. Any student being monitored that is due for re-evaluation shall also be referred for assessment. For every referral, a Consent for Assessment will be sent home for parent/guardian signature prior to the start of any gifted education assessments. Notification of eligibility results will be sent home within 90 instructional days from the receipt of this signed consent for assessment form. When enrolling children in a Chesterfield County public school, parents/guardians shall notify the enrolling school if the student was identified for gifted services in the previous school system. This ensures that the receiving school obtains necessary gifted education documents. After confirming the gifted identification from the previous school system, the school will place the child in services most comparable to those in the student’s last school. 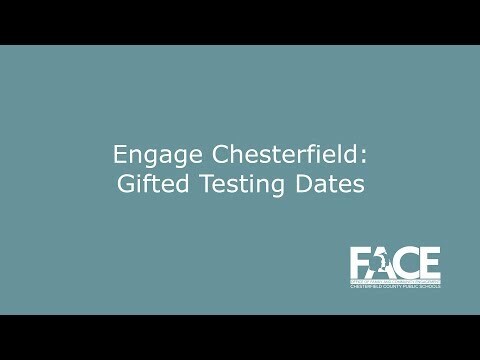 When possible, the child will be evaluated for gifted services eligibility using Chesterfield County criteria prior to the end of the school year. A previous identification in another school system does not automatically guarantee eligibility for CCPS gifted education services. Those whose main residence exists in Chesterfield County but whose child is currently in second grade or higher and is not enrolled in a Chesterfield County public school must complete the Private or Homeschool Student Referral Form if they wish their child to be evaluated for gifted services eligibility prior to enrolling for the next school year. This form must be obtained from the public school the child would attend if enrolled, and it must be returned to that school prior to the referral deadline. This school will process the referral, and any required testing will occur at this location according to the group testing schedule established by that school. Other required components of the identification protocol that include grades, work samples, and teacher perception inventories will be requested from the student’s current nonpublic school. These components must be provided in order to determine student eligibility for services. In grades 1-8, these students are clustered in a group with other identified gifted children for instruction that targets their identified areas of strength. In grades 3-8, elementary and middle school CBG Academies provide an additional opportunity for challenging instruction. This offering uses advanced content, pacing, and instructional strategies to deliver an enhanced rigor and challenge. Core content area classes in CBG Academies are composed of only students qualifying for the academy. The high school honors program in English, mathematics, science, and history/social sciences provides rigorous curriculum experiences for gifted students in grades 9-12. Additional offerings include advanced placement courses and dual enrollment opportunities. Regional programs and specialty centers provide comprehensive services for students with high ability and interest in specific areas. The purpose of the committee is to review annually the Local Plan for the Education of the Gifted and to determine the extent to which the plan for the previous year was implemented. It is composed of parents of identified gifted students, community members, identified gifted students, teachers, and administrators. Meetings are open to the public. Information on meeting dates and locations may be found on the Chesterfield County School Board site or by contacting the Office of Gifted Education.